Everything about Garonga simply oozes romance – from the gorgeous rooms to the hand written welcome notes, the little sand Zen gardens to dining by flickering lamplight, not to mention pampering massages in the sala! For a memorable romantic experience you have to enjoy the stunning bush bath experience – nothing like the 2 of you soaking in a foamy bath with nature all around you! Wonderfully comfortable and huge bed nestles under a gorgeous mosquito net that hangs suspended from a copper pipe frame – very stylish and utterly romantic! Garonga struck us as being by far the most romantic game lodge we have ever experienced - this "safari for the soul" remains our top recommendation for honeymooners and anyone looking for a romantic experience without equal! We were lucky enough to stay at Garonga Safari Camp in the late 90’s, a couple of years after it opened (and long before Bushscapes was even a gleam in our eye!) It struck us then (and nothing has changed in the intervening years) as being by far the most romantic game lodge we had ever experienced! Today it remains our top recommendation for honeymooners and anyone looking for a romantic experience without equal! 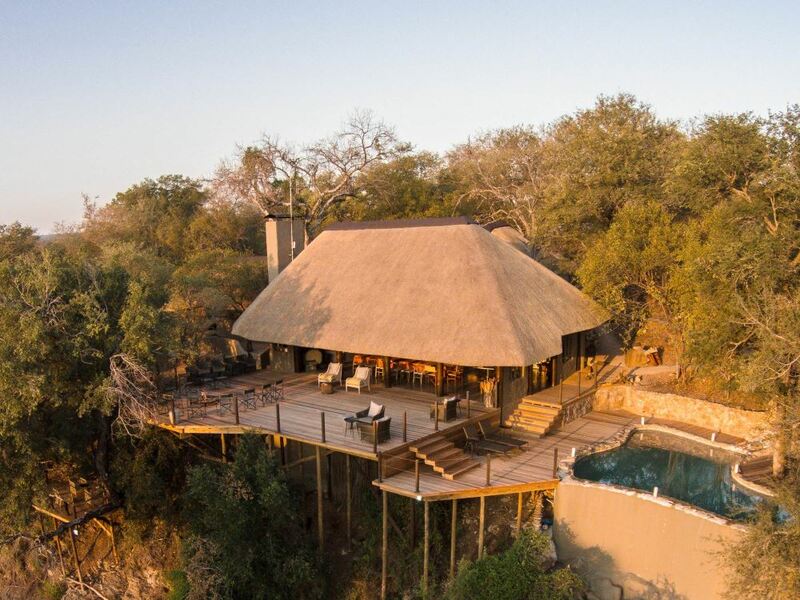 Situated in the 22 000 hectare Makalali Conservancy, close to many of the other private lowveld reserves, it offers excellent game viewing even if that isn’t the lodge’s overriding aim. 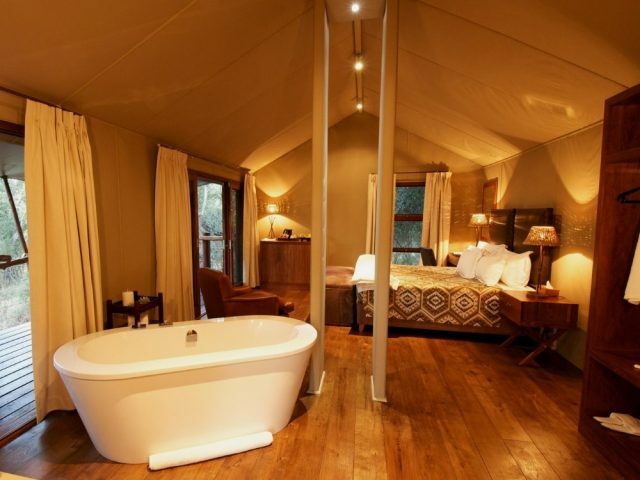 You see, whilst many game lodges can sometimes seem obsessed with rushing around in order to show their guests the entire Big Five at all costs, at Garonga it’s a much more holistic and unpressurized approach where the objective is to get guests to fully relax and reconnect with the bush, their partners and themselves. In fact they call it “a safari for the soul” and it takes the form of an unhurried and intimate wildlife experience where there is time to reflect and find inspiration in nature. You have the choice of trying your hand at every activity on offer or simply doing nothing at all – there’s no pressure on you at all! 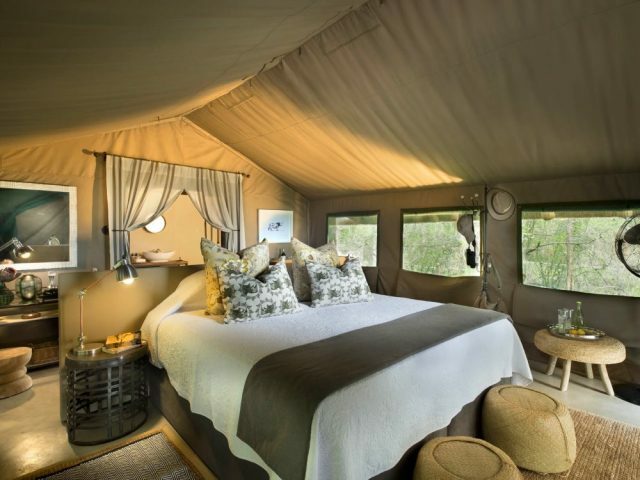 If you don’t fancy getting up at the crack of dawn for the morning game drive, then no problem – you can rise at your leisure before perhaps lazing in the hammock on your private deck with a good book or escaping to the Sala for a calming (or invigorating) treatment or massage. A couple of the activities available at Garonga stand out from the rest. Prime amongst these has to be the Bush Bath experience where a romantically decorated and lit bath is prepared by the lodge in a stunning open-air location for you to enjoy as a couple! Another experience not to be missed is the chance to sleep out under the stars on a platform raised above the bush and overlooking a waterhole – the 2 of you are left for the night with a mouth-watering picnic hamper, a cooler box and hot drinks and collected in the morning after an unforgettably romantic night under the African sky! 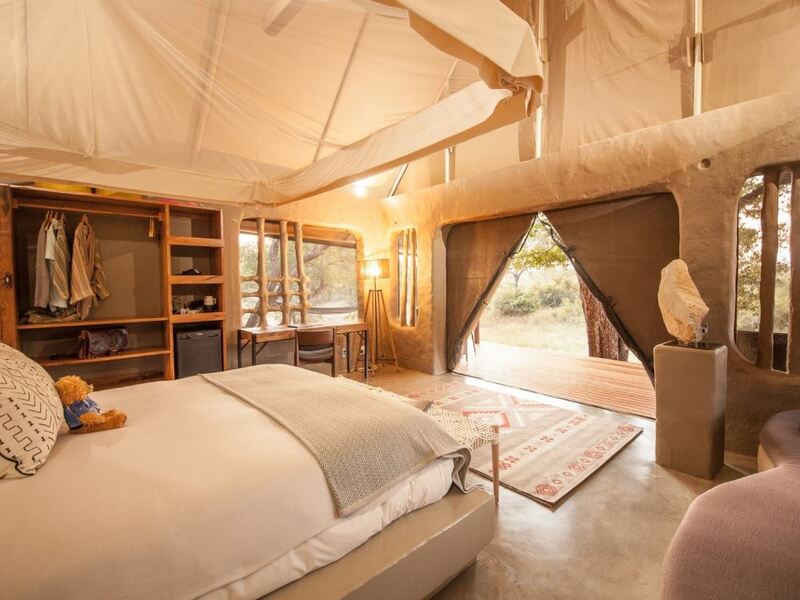 The 6 exclusive tented rooms at Garonga are situated in a great location, overlooking a dry riverbed and spring fed waterhole, and are some of the most unusual and stylish that we’ve seen at any game lodge. The colour, texture and stunning design of the walls of both the rooms and the main lodge buildings have been inspired by the huge termite mounds which you’ll see dotted about the bush on your drive from the gate to the camp. They’re called “tents” but this really just applies to the canvas roofs as the rest of the rooms are of solid construction. Ultimately they’re some of the most attractive and memorable rooms we’ve ever slept in, with a simply massive bed (so big you're almost in danger of losing each other!) draped romantically with a mosquito net suspended from a gorgeous copper tube framework! The rooms are light, airy and spacious with fans to keep you cool in hot summers - in addition to the indoor shower, there is an outdoor shower (always a big favourite of ours here at Bushscapes!) 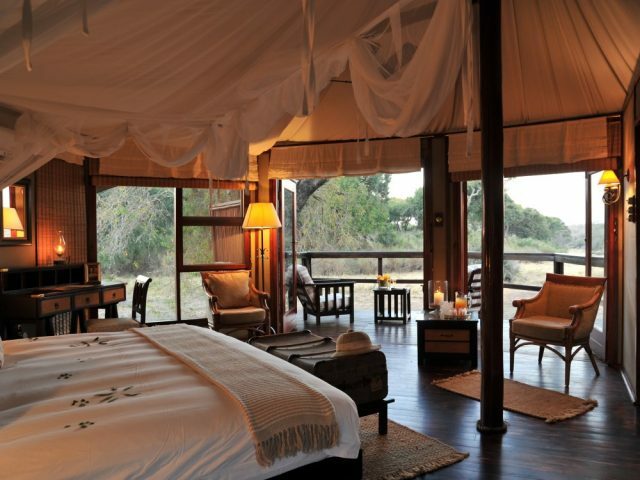 which provides the perfect link between the luxury and romance of the suite and the surrounding bush. A perfect place to while away the hours is in the hammock on your private wooden deck with its wonderful views onto the animals coming down to drink at the waterhole and the countless birds flitting about amongst the surrounding trees! We haven’t spoken much about the game experience yet but the twice-daily game drives offer excellent game viewing – it might not match the heights of the Sabi Sands but we personally had a memorable sighting of lions on the hunt, another big male roaring, not to mention an excellent sighting of a leopard with cub! One of the great things about the Makalali Conservancy is that with just 2 lodges you rarely see another vehicle ensuring that your close encounters are exclusive and uncrowded. All of the Big Five are now present with a herd of disease-free buffalo having being introduced to the reserve a few years ago. Back at the lodge after your drive, there’s a lovely open plan lounge and dining room with a huge fire place for those chilly winter evenings where you get to gather and chat to other guests before your dinner – the main deck boasts a swimming pool in which you can cool off in the hot summers and view game on the dry river bed below. Meals at Garonga are an unforgettable experience as you get to enjoy them at various locations (and drinks are also included which is a real bonus!) and the lodge is flexible according to your preferences – if you’ve made friends with a bunch of fellow guests then they may seat you all at a big round table in the main lounge area, or in the boma around a bonfire – if you’re on a romantic break and want privacy you’ll get a private tables tucked away on the deck. One of our most vivid memories in fact was enjoying a stunning dinner on the deck by romantic lamplight with hot coals from the fire placed onto a large metal dish to give welcome warmth against the chill of winter – all in all it was unforgettably romantic and sums up what Garonga is all about! Children 12yrs and older will be accommodated in their own rooms at the normal adult sharing rate.